PennsylvAsia: "Characters and Words in Learning and Teaching Chinese," December 7 at Pitt. "Characters and Words in Learning and Teaching Chinese," December 7 at Pitt. 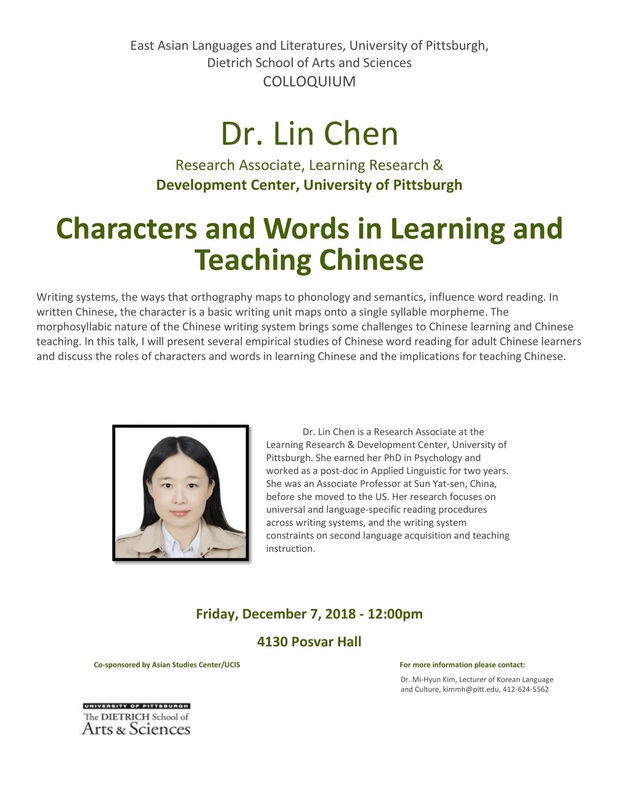 Dr. Lin Chen of the University of Pittsburgh's Learning and Research Development Center will present "Characters and Words in Learning and Teaching Chinese" on December 7. Writing systems, the ways that orthography maps to phonology and semantics, influence word reading. In written Chinese, the character is a basic writing unit maps onto a single syllable morpheme. The morphosyllabic nature of Chinese writing system brings some challenges to Chinese learning and Chinese teaching. In this talk, I will present several empirical studies of Chinese word reading for adult Chinese learners and discuss the roles of characters and words in learning Chinese and the implications for teaching Chinese. Dr. Lin Chen is a Research Associate at Learning Research & Development Center, University of Pittsburgh. She earned her PhD in Psychology and worked as a post-doc in Applied Linguistic for two years. She was an associate professor at Sun Yat-sen, China before she moved to US. Her research focuses on universal and language-specific reading procedures across writing systems, and the writing system constraints on second language acquisition and teaching instruction. The talk starts at 12:00 pm in 4130 Posvar Hall (map).